A few years ago I read Danny Thomas' autobiography. It was brilliant, taking the reader on a journey from childhood to one of the true Kings of Comedy. Danny Thomas was the driving force, and producer of, at least five prime time sitcoms, and along the way, set the standard for the genre. Mr. Thomas passed away just before completing the recording of his book. 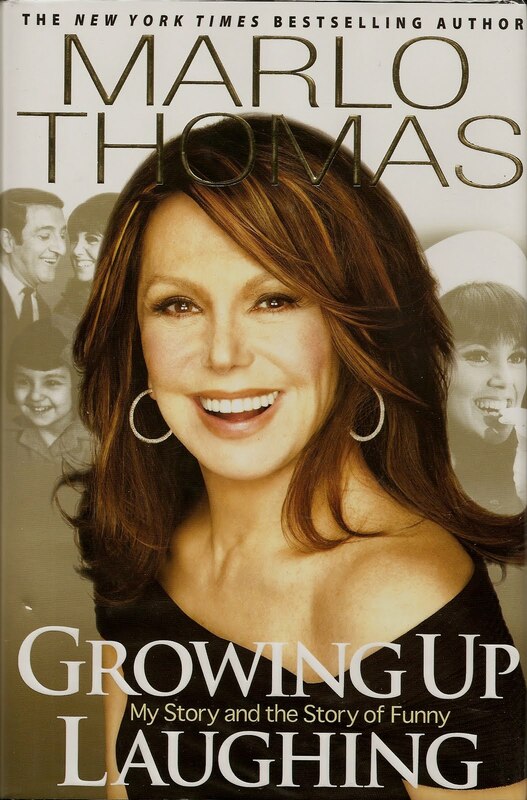 His daughter, Marlo Thomas, of "That Girl" fame, went on to finish the book tape. Several chapters of the book "Make Room For Danny" had not been recorded, and in a stroke of genius, Ms. Thomas decided to finish the tape by having her fathers friends, all famous comedians themselves, read portions of the final chapters. That was great. But what was even better was that she read the final chapter of her father's book herself. This was about 15 years ago and I instantly became a fan of Ms. Thomas and her outlook on life. The author takes you from her childhood, growing up surrounded by the legends of comedy; luminaries such as Milton Berle, Henny Youngman, and George Burns, just to name a few, had a profound effect on the author and the direction her life would take. With priceless stories of family dinners, and the entertainment provided by some of Hollywood's funniest people in her home, this book engages the reader from page 1, and doesn't let go until the very last page. The story of Danny Thomas not being allowed to join the Hillcrest Country Club in Hollywood is hysterical. At the time, Jews were not allowed to join any of the exclusive Country Clubs in Hollywood. So, they formed their own. And one day some one realized that Danny Thomas, with his large nose, and dark Middle Eastern looks, was not Jewish at all! A meeting was hastily arranged and a vote taken. All voted to let Mr. Thomas join, except Groucho Marx. His problem was that the "non-Jew" looked too Jewish. He relented under very little pressure and Danny Thomas was a member of the Club for the remainder of his life. Organized in a most unusual manner, the narrative shifts from Ms. Thomas' early recollections as a child, to stories of her mother and father. This would be enough to make a good book. But what makes this book so different and insightful, are the interviews she conducts with some of today's top comedians, and the influence that Danny Thomas and his contemporaries had upon them. Some of the interviews are conducted by phone, others by printed questions, and some in person. This gives the book a feeling of spontaneity, almost as if the reader is part of the conversations. Using interviews with Lily Tomlin, Billy Crystal, Jerry Seinfield, Whoppi Goldberg and Joan Rivers, to name a few, underscores this influence, making the book all the more relevant. Exploring the different approaches taken by various comedians, ranging from Sid Caeser to Chris Rock, is a veritable education in comedy. What makes an audience happy? How do you read them within a few minutes of taking stage? Conan O'Brien and Jay Leno weigh in on this issue, providing the answer to what makes people laugh, and more importantly, why? Some of the best parts of this book are the wonderful, and loving stories, that the author tells about her father. She clearly adored him, as did everyone who knew him. The book also delves into the way Hollywood, and the entertainment industry, treated women in the early 1960's. Ms. Thomas' show, "That Girl", paved the way for Mary Tyler Moore, Rhoda and all the female based sitcoms that surfaced in the 1970's. These werenot Lucille Ball type characters. They were independent, strong willed women. Most people are unaware that Ms. Thomas, along with Betty Friedan and Bella Abzug, were partners in setting up the Ms. Foundation. In spite of her feminist leanings she finds herself meeting with, and subsequently becoming married to, Phil Donahue, a veritable love story in itself, that still endures today. This is a very unusual feat in the entertainment business, where long separations are often the norm. Before reading this book I had no idea at what the author had accomplished on her own, beyond "That Girl". In a career which now spans over 40 years, Ms. Thomas has played all sorts of roles, from an Indian on a TV western to the lead role in the London Production of "Barefoot In the Park". She posesses all the skills of a "triple threat." She acts, produces and directs. In the 1980's she was the driving force behind "Free to Be - You and Me", which won awards for it's message of tolerance and understanding. Several more books followed. This is a very entertaining book. I read it in 2 days, picking it up in every spare moment available. Of course one of my favorite parts concerned the St. Judes Children's Center, which Danny Thomas began in fulfillment of a pledge he had made to St. Jude when he was expecting his first child and had no money. That Ms. Thomas, along with her brother and sister, all continue to support the activities at the hospital speaks volumes about them as people. It also says a lot about the parents who raised them. An accomplished author, actress, Emmy winner, activist and wife, this woman has done it all. And very quietly, too. This is a very comfortable read.